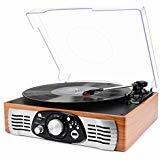 If you are an old school musician or a music lover who prefers that vintage sound, your life is simply incomplete without your own record player. The truly vintage ones may cost a fortune, but there are far cheaper modern options that cost as little as $50. Modern record players also have additional features like greater volume control and USB connection ability. The best cheap record player on the market right now is the Jensen JTA-230. Our list is limited to record players that cost $100 or less. Here are some more of the best budget record players to choose from. 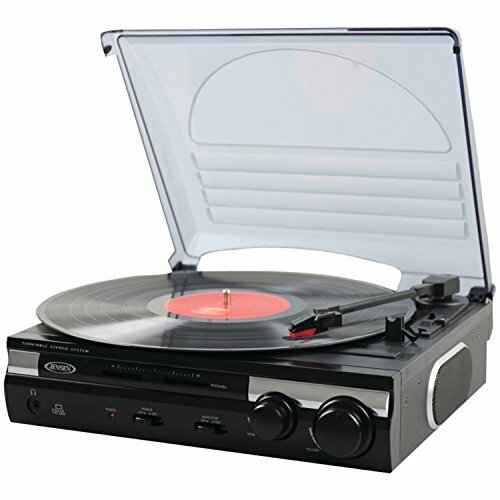 This is the best cheap record player you will find online. This turntable is belt driven and has three speeds. There are pitch controls to adjust record speed, volume and tone as you like. It comes with a neat dust cover too. USB ports are available to connect the turntable to a computer so you can convert vinyl records to digital mp3 format. The record player comes with the necessary software for converting files, recording and editing. Two Aux input jacks are also included to connect a music player or headphones. Build quality may not be top notch but this record player will last a long time. Overall, it is a very solid investment. 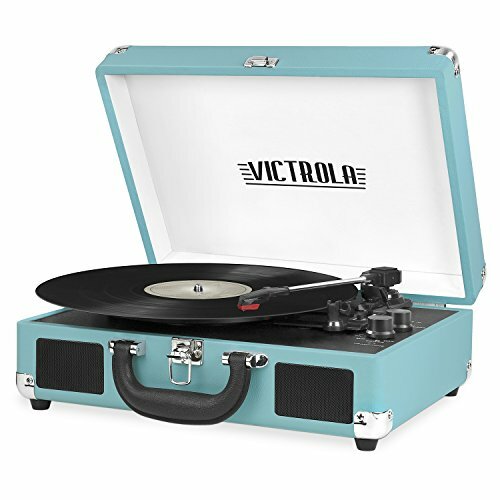 This 3-speed turntable comes in wonderful colors like turquoise. 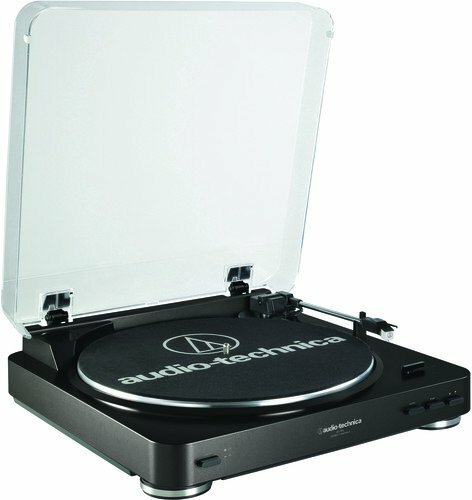 Not only is it designed stunningly to fit compact spaces, this record player is quite durable as well. It comes with built-in Bluetooth capabilities to play music wirelessly from another Bluetooth-enabled device. The record player is housed inside a very portable suitcase, so you can take this anywhere. No USB port is available though. But it has built-in stereo speakers and jacks for connecting headphones or non-Bluetooth devices. 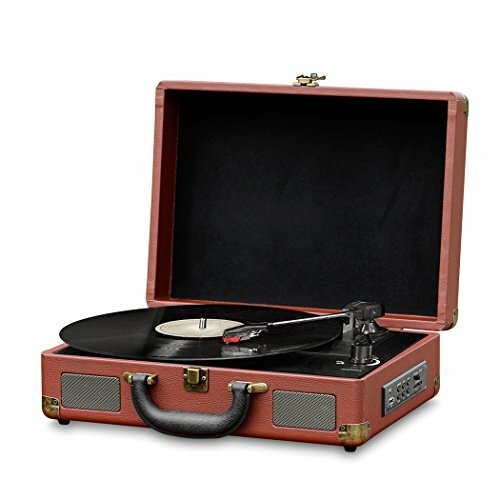 This record player looks like an authentic genuine vintage turntable. It has a wooden appearance but is not made from wood. It comes with a dust cover and a front panel with controls. You can select 3 RPM speeds. Stereo speakers are front facing for full spectrum sound. It has an RCA output to connect to external speakers. This is the option I chose because the built-in speakers don’t have really top quality sound output. I find this record player particularly appealing because it comes in handsome black casing. If you like a record player to keep in an office, this will be a good choice. Other than the exterior, the specs are quite basic. It has 3 RPM speeds, built-in Bluetooth, Aux outlets, headphone jack and built-in stereo speakers. The speakers emanate a rather soft sound that doesn’t fill a room. So if you want the best sound you will have to connect it to an external speaker system. This record player is fully automatic. That means you don’t have to keep adjusting the cue. Just insert the record and play. Operation is easy and rather simple. The record player has 2 speeds. There’s a built-in switchable photographic amplifier too to improve the sound quality of the records. Overall, I got clearer sounds with this record player than any other. It is anti-resonance because the platter is made from die-case aluminium. It has RCA output jacks to connect to external speakers or sound devices. It comes with a magnet phonocartridge and a diamond stylus that can be replaced. Plus, the exterior looks very modern and stylish, it takes a while to notice that this is a record player. I would say that this is one of the best cheap record players that is fully automatic. 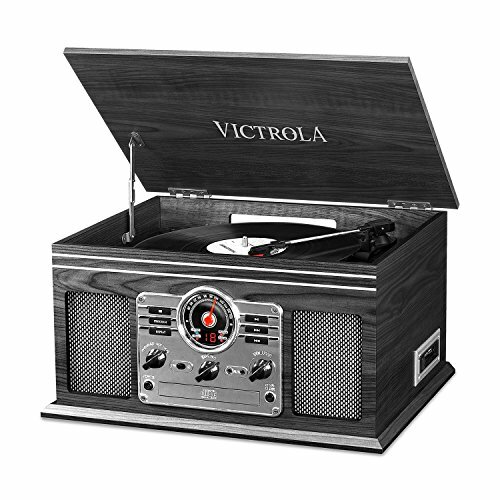 Go back to the twenties with this charmingly classic looking record player. This partially wooden turntable looks deceptively like an authentic vintage product. Not only can this play vinyl records in 3 speeds, it also has a CD player, a cassette player and an FM radio. Despite how it looks, this turntable is Bluetooth enabled. It has built-in stereo speakers and Aux output jacks. This is definitely one of the best budget record players worth investing in. 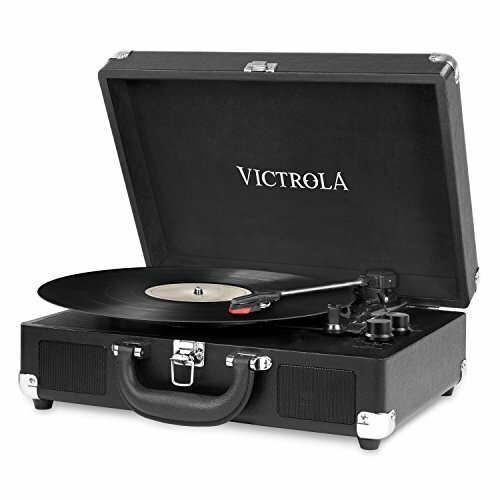 This classic looking turntable comes in a handsome briefcase enclosure. It has all the modern features, including Bluetooth, USB ports and Aux outlets. In addition, there’s an SD card slot as well. It comes with software to convert vinyl records to digital files. The built-in speakers are full range and can easily fill up a room with sound. 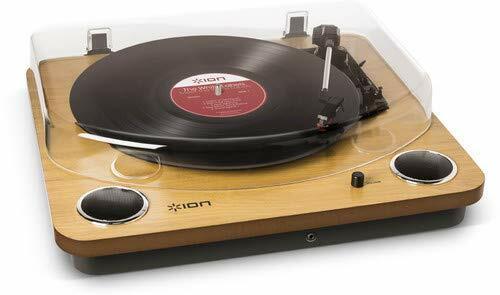 This is a gorgeous turntable with a wood-looking base and a transparent dust cover. It has 3 speeds, built-in speakers, USB port, headphone output and comes with software to convert music files into digital format. The build quality of this product is quite exceptional. It’s relatively simple to use as well and will be a great addition to any household. It will help to understand the basic components of a turntable before you buy. Knowing the parts will help you choose the best specs. Budget record players that cost less than $100 are highly capable of accomplishing the basic tasks of a turntable. However, do expect to sacrifice one thing or another. Some may have sound quality issues that you have to deal with. It’s worth it to spend more money on a budget record player that allows for upgrades. The really cheap ones may not accommodate upgrades or repairs and you might need to buy a new one entirely in case something happens. Buy a record player with a USB port. You will be able to transfer your tracks to digital format. If you have really old or rare records, this should be a priority to preserve your music. Record players come in both manual and automatic formats. A manual cueing system is a traditional way and it’s really easy to learn how to do right. With the automatic ones cueing is not necessary and records will start playing with a press of a button. There is little price difference between the two so the choice is up to your preferences.